Are you proposing on the first date? Tips for taking your donor from the first-time gift to lifetime… If you missed last week’s Motivate Monday featuring the marvelous Ken Burnett, you’ll want to watch the episode in its entirety now. Are you so “over” the gala (I know I am!)? Try A Better Gala—Here’s How This Foundation Marked a Key Milestone. Ever doubt yourself? Confidence: how to find what you need. New from Mary Cahalane. A key component of Simple Development Systems has always included tracking the Fundraising Metrics That Matter. 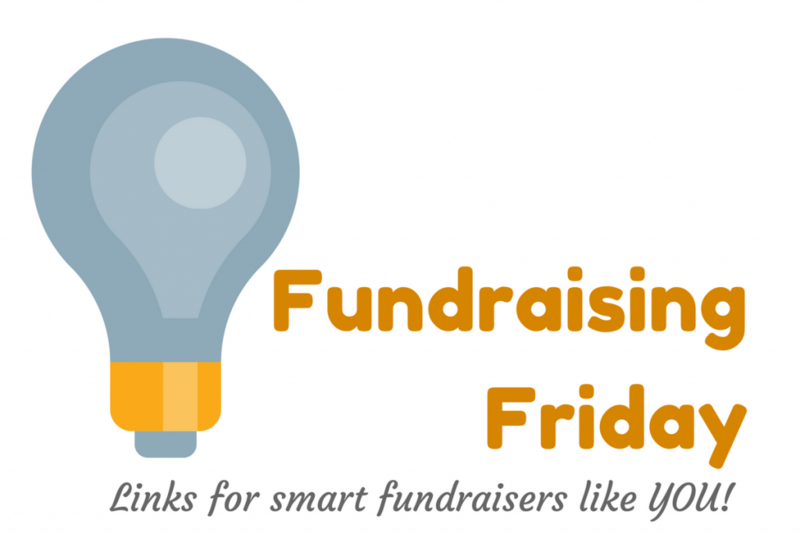 Smart fundraisers know. Some type of fundraising dashboard system — to report to your ED and board, to adjust and tweak your plan, to understand your donors — is essential. New from The Agitator. The Secret To Happiness In A World Gone Nuts. New from The Agitator. Is crowdfunding really a good thing? Before you plot out your next crowdfunding campaign, be sure to begin with the end in mind. The People Gofundme Leaves Behind. Imagine if Apple had to run like a nonprofit. Another thought-provoking – and funny take – from Vu. Although I have to say that we as a sector are often responsible for many of these issues. What would it look like if we didn’t spin our wheels responding to outlandish foundation guidelines — and instead focused our attention on building a base of general operating support from smaller foundations with less cumbersome requirements? What if we ignored the charity watchdog agencies and instead focused on growing the best possible organizations — by hiring and training the best people? What if we utilized best donor-centered practices in fundraising and built robust individual giving programs? We’ll never overcome the rampant dysfunction in our sector by playing along with the games. Are you a reader? I am. And I’m always looking for new sources of book recommendations (the Sunday Book Review of the NYT is worth the price of the subscription). For interesting non-fiction and general fun and eclectic trivia, subscribe to the daily emails from Delancey Place. I can promise you that you won’t regret it. All profits go to children’s literacy projects. Another reminder: You are not your donor. Be Aware of WHO is Giving. New from the Veritus Group. Ha! Yes, you do stress too much over typos. Sign the enclosed placenta: The weird power of errors in fundraising. New from Jeff Brooks. It’s the truth: as a sector, we’re accustomed to dysfunction. Sometimes we’re mired in it. We’re used to a mentality of lack, rather than embracing the abundance that surrounds us. Have you gotten “used to the squirrels” in your organization? What’s the real secret to fundraising success? It’s all about your story. How are you creating the stories that resonate with your donors — and drive donations? Do you know that you could be raising more money with more effective storytelling, but you don’t know where to find your organization’s best stories? Are you looking for ways to get your board members, staff, and volunteers involved in the storytelling process? Enrollment ends today for Nonprofit Storytelling | Basics & More™. Register now. How much time do you spend — or waste — encouraging your board to help with fundraising? If you missed Andy Robinson’s Motivate Monday session, you’ll want to watch it now. Check out the Archives. And join us on July 10 at 1:00 pm EST when our guest will be Linda Lysakowski. Save your seat here. Next post: Do your board members say they’ll do anything but fundraise? Relax!